Create beaded necklaces, bracelets, and other jewelry with a professional look and finish. This delightful beginner's guide presents step-by-step instructions and helpful illustrations that walk you through the basics of making beaded jewelry. You'll learn how to use various pliers, crimpers, and wire cutters, and choose the perfect beads and string for your projects. In no time at all, you'll be stringing together your own pieces, complete with clasps, rings, and cones. 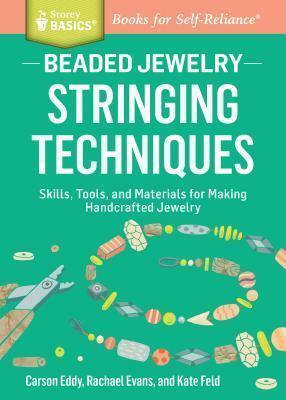 Learn to create stunning earrings, bracelets, and necklaces by matering a few basic techniques. Then all you need to transform a collection of beads into one-of-a-kind jewelry are stringing materials, findings, and some simple tools. Carson Eddy, Rachael Evans, and Kate Feld, longtime bead enthusiasts who design and teach at the Boston Bead Company, describe clearly, with step-by-step illustrations, how to master the methods and choose the right materials for success with any project.